Happy Sunday! I hope everyone’s enjoying their non-routine, wacky schedules these past few days. It’s so weird having Christmas and New Years smack, dab in the middle of the week. But I guess it gave everyone a good amount of time off! I took last Monday off and have tomorrow and Tuesday off as well. I can get used to 5 day weekends! For Christmas my mom gave me a crock pot. I used to share a crock pot with my best friend and roommate, but when I moved out of Boston I left it with her so I was so excited to get my own! For my first crockpot meal I decided to do a slow cooked brisket. I searched and searched the web for ideas that were easy and simple. To be honest it was hard to find a paleo / primal friendly recipe that was also easy. I would have loved to try a barbecue version but it seems making a paleo friendly barbecue sauce requires a lot of ingredients. Well it did not disappoint! I actually left the rub on for two days (because of change of plans) and then cooked it in the crock pot for about 9 hours. It came out so tender and tasty! 1½ cups of Coconut Milk. I used Pure Silk’s unsweetened version because I couldn’t find canned. Combine coffee, cumin, salt, and cocoa powder. Throw the rub in a big bowl or container. 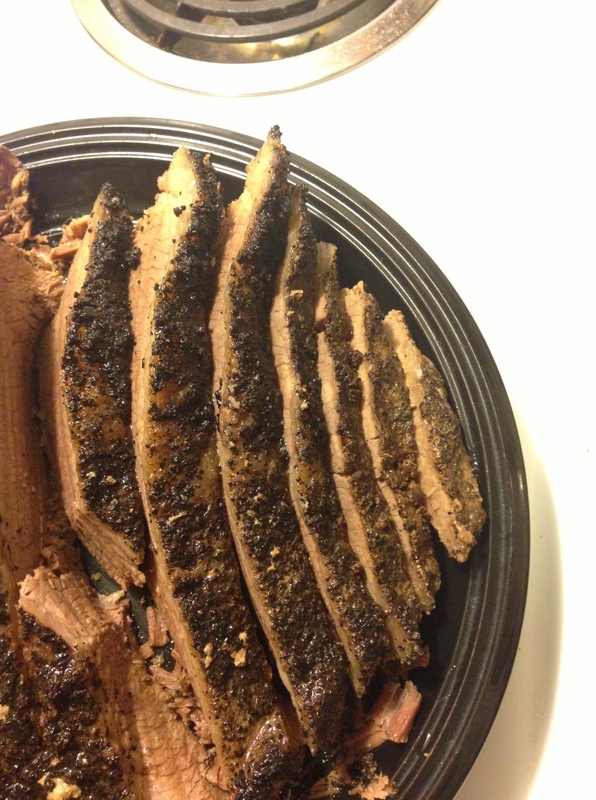 Place your brisket in the spices and rub it into the meat. I let mine sit for two days but I am sure it would be fine without so much time. To cook I poured the coconut milk into the crock pot and then the brisket (fatty side up) on top. I cooked it on low for 9 hours. It came out dee-licious! Glad you loved the recipe! It’s one of our favorites too. If you are looking for other easy Paleo crock pot meals, my most popular is my Paleo Pork Shoulder Pernil Carnitas Style. It is to die for (but clearly I am biased)! Good luck and happy crockpotting! Coffee…love. Cocoa….love. 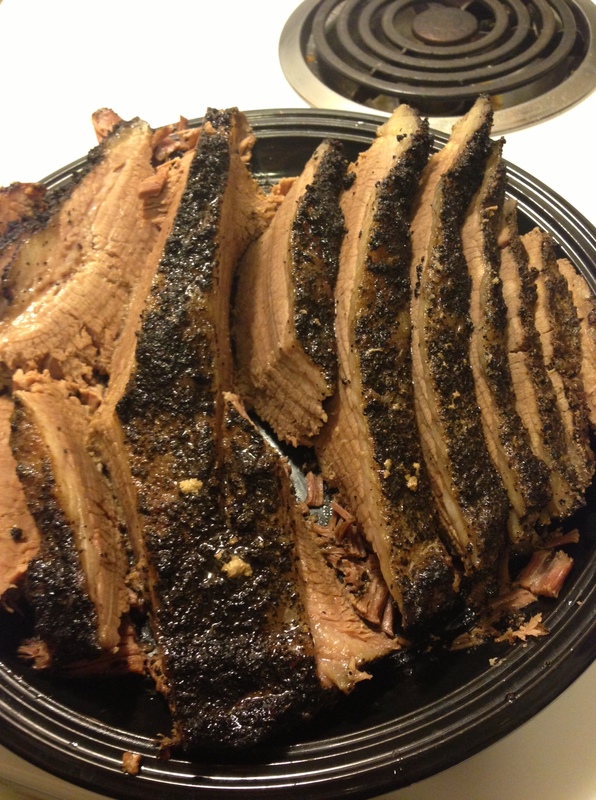 Brisket…LOVE! Can’t wait to try this! Now the question is, get back to work or keep looking through your blog? Decisions, decisions. Can you taste the coffee? My boyfriend is not a coffee drinker so not sure if he would like? You can taste a hint of it. But my boyfriend is super picky and he loved this recipe!